Тема в разделе "Чистилище", создана пользователем AllHYIPs, 23/10/18. Sonata Bit LTD +8.1 Received Payment 8.1 USD from account U17356511. Memo: API Payment. Withdraw to Fairmonitor from sonatabit.com. Sonata Bit LTD +1.2 Received Payment 1.2 USD from account U17356511. Memo: API Payment. Withdraw to Fairmonitor from sonatabit.com. Sonata Bit LTD +9.45 Received Payment 9.45 USD from account U17356511. Memo: API Payment. Withdraw to Fairmonitor from sonatabit.com. Sonata Bit LTD +7.5 Received Payment 7.5 USD from account U17356511. Memo: API Payment. Withdraw to Fairmonitor from sonatabit.com. Sonata Bit LTD +12.2 Received Payment 12.2 USD from account U17356511. Memo: API Payment. Withdraw to Fairmonitor from sonatabit.com. Sonata Bit LTD +17.7 Received Payment 17.7 USD from account U17356511. Memo: API Payment. Withdraw to Fairmonitor from sonatabit.com. Sonata Bit LTD +9.00 Received Payment 9.00 USD from account U17356511. Memo: API Payment. Withdraw to Fairmonitor from sonatabit.com. Sonata Bit LTD +9.6 Received Payment 9.6 USD from account U17356511. Memo: API Payment. Withdraw to Fairmonitor from sonatabit.com. 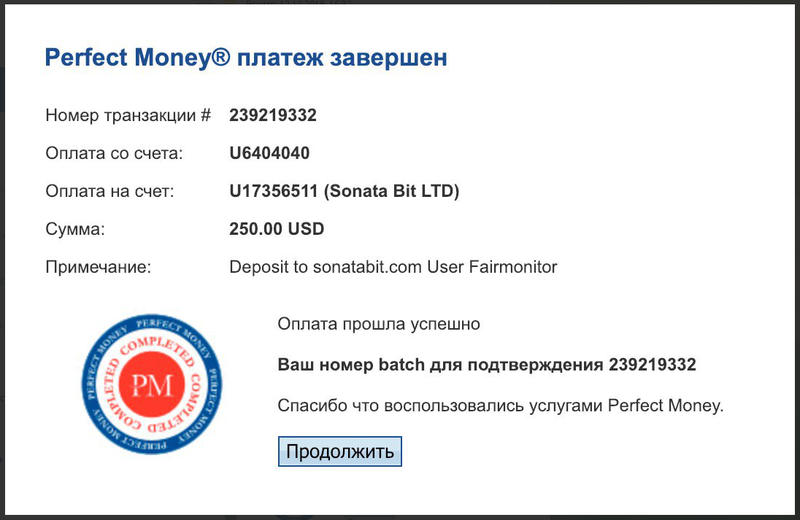 Sonata Bit LTD +8.25 Received Payment 8.25 USD from account U17356511. Memo: API Payment. Withdraw to Fairmonitor from sonatabit.com. Sonata Bit LTD +11.45 Received Payment 11.45 USD from account U17356511. Memo: API Payment. Withdraw to Fairmonitor from sonatabit.com. Sonata Bit LTD +8.85 Received Payment 8.85 USD from account U17356511. Memo: API Payment. Withdraw to Fairmonitor from sonatabit.com. Sonata Bit LTD +8.00 Received Payment 8.00 USD from account U17356511. Memo: API Payment. Withdraw to Fairmonitor from sonatabit.com. Sonata Bit LTD +11.85 Received Payment 11.85 USD from account U17356511. Memo: API Payment. Withdraw to Fairmonitor from sonatabit.com. 03.12.18 06:22;Account;Receive;Received Payment 6.00 USD from account U17356511 to account U1294000. Batch: 238366162. Memo: API Payment. Withdraw to allhyips from sonatabit.com. 04.12.18 05:05;Account;Receive;Received Payment 6.00 USD from account U17356511 to account U1294000. Batch: 238473280. Memo: API Payment. Withdraw to allhyips from sonatabit.com. 05.12.18 05:02;Account;Receive;Received Payment 6.00 USD from account U17356511 to account U1294000. Batch: 238586812. Memo: API Payment. Withdraw to allhyips from sonatabit.com. 06.12.18 04:36;Account;Receive;Received Payment 6.00 USD from account U17356511 to account U1294000. Batch: 238691869. Memo: API Payment. Withdraw to allhyips from sonatabit.com. 07.12.18 04:12;Account;Receive;Received Payment 6.00 USD from account U17356511 to account U1294000. Batch: 238796627. Memo: API Payment. Withdraw to allhyips from sonatabit.com. инстант 12.08.18 20:45 Account Receive +0.6 Received Payment 0.6 USD from account U17356511 to account Batch: 238972990. Memo: API Payment. Withdraw to Irina22 from sonatabit.com. 08.12.18 04:34;Account;Receive;Received Payment 6.00 USD from account U17356511 to account U1294000. Batch: 238898467. Memo: API Payment. Withdraw to allhyips from sonatabit.com. Sonata Bit LTD +9.75 Received Payment 9.75 USD from account U17356511. Memo: API Payment. Withdraw to Fairmonitor from sonatabit.com. Инстант 12.09.18 14:33 Account Receive +0.6 Received Payment 0.6 USD from account U17356511 to account Batch: 239034953. Memo: API Payment. Withdraw to Irina22 from sonatabit.com. Sonata Bit LTD +3.6 Received Payment 3.6 USD from account U17356511. Memo: API Payment. Withdraw to Fairmonitor from sonatabit.com. Sonata Bit LTD +5.65 Received Payment 5.65 USD from account U17356511. Memo: API Payment. Withdraw to Fairmonitor from sonatabit.com. Инстант 12.11.18 14:58 Account Receive +0.6 Received Payment 0.6 USD from account U17356511 to account Batch: 239253825. Memo: API Payment. Withdraw to Irina22 from sonatabit.com. 11.12.18 06:22;Account;Receive;Received Payment 6.00 USD from account U17356511 to account U1294000. Batch: 239201520. Memo: API Payment. Withdraw to allhyips from sonatabit.com. 10.12.18 19:02;Account;Receive;Received Payment 6.00 USD from account U17356511 to account U1294000. Batch: 239165741. Memo: API Payment. Withdraw to allhyips from sonatabit.com. Выплата 12.12.18 18:54 Account Receive +0.6 Received Payment 0.6 USD from account U17356511 to account Batch: 239385258. Memo: API Payment. Withdraw to Irina22 from sonatabit.com.